Despite further escalations in the US-China trade dispute, steady economic fundamentals and strong earnings have powered growth-oriented assets. In July, equities in the European and Emerging Markets led with returns of 5.1% and 4.2%, respectively. The consumer staples sector in the US, the underdog of 2018, has also turned around with a 4.2% return. As for the S&P 500, its July gain of 3.9% has put it closer to fully recovering from the market correction that began at the end of January. What is the “Yield Curve Recession Fear”? Is it real or hype? The yield curve is a plot of bond yields against the length of time they have before their maturities. When short-term rates rise faster than long-term, the spread between the two narrows and we have what it’s called the “yield curve flattening” scenario. Economic theory suggests that a very flat (or inverted) yield curve could lead to a recession, and this has become quite a hype in the media. The reality is that past economic cycles have shown us that yield curve inversions were not a reliable recession timing tool. Stocks can continue to climb substantially and for a long time well after the inversion. Taking these signals too literally can be costly to investors. Focus on what really matters (fundamentals, valuation, and diversification), and avoid being influenced by hearsay or naysay (such as the yield curve fear). The current economic environment is favourable for growth-oriented assets, but investors should always maintain a diversified portfolio that has a sufficient amount of protective assets. The trade tension between the US and China has continued to escalate. Shortly after the US threatened to impose fresh tariffs on another $200 billion of Chinese imports, President Trump upped the ante by asking US Trade Representative Robert Lighthizer to consider hiking the tariff rate from 10% to 25%. In return, the nationalist paper Global Times in China has signaled that China is prepared for a protracted war and doesn’t fear sacrificing short-term economic interests. Despite these escalating trade disputes, growth-oriented assets posted strong gains in July. As can be observed in Figure 2, the leaders among growth oriented assets were equities in Europe, Emerging Markets and the S&P 500, each gaining 5.1%, 4.2% and 3.9% respectively. 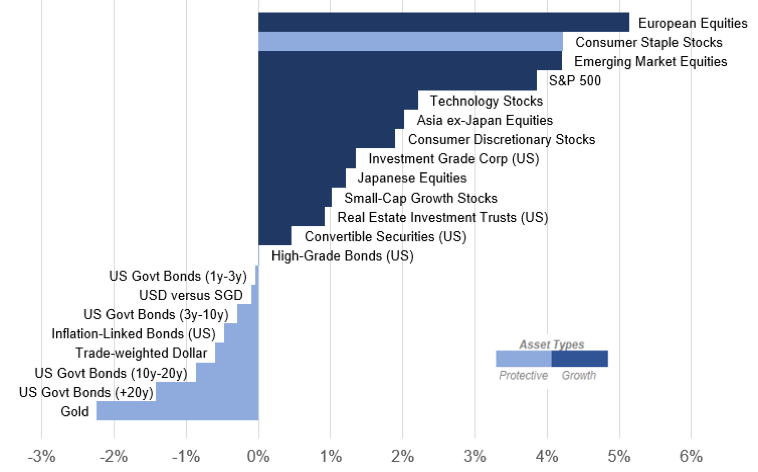 With the exception of consumer staples (which made a remarkable turnaround with a 4.2% return in July), protective assets generally underperformed. In particular, 10-20y and >20y US Government bonds and Gold lost 0.9%, 1.4%, and 2.2%, respectively. Traditionally, the consumer staples sector is considered to be one of the safest corners of the stock market because it consists of non-cyclical companies that manufacture or sell essential consumer goods (e.g. beverages, household and food products). In recent years, the shift toward e-commerce has empowered consumers to seek value and compare prices when they shop. This in turn reduces the pricing power of staples companies. Additionally, there is a dearth of new products produced by staples companies that appeal to consumers’ changing tastes. So, it is understandable that the sector is underappreciated by investors. But it’s important to keep in mind that a long-term portfolio should always maintain a sufficient amount of protective assets, even in good times. When measured against economic factors that StashAway’s ERAA tracks, the sector is undervalued and will deliver extra 6.1% returns per annum versus its average, giving long-term investors the opportunity to diversify their portfolios. First, what is the yield curve? The yield curve is a plot of bond yields against the amount of time they have until they mature. If one graphs the yields of government bonds against time to maturities, the plot is known as government bond yield curve. We can also graph the yields of other classes of bonds to obtain yield curves for investment grade and high yield corporate bonds. When the banking system is functioning properly (without distortions from policy or any other factors), the yield curve tends to be upward sloping. In this environment, lenders, such as banks, would be happy to borrow in the short-term (by accepting deposits from savers) and make longer-term loans (5 years and longer) as they enjoy profitable net interest margins. On the other hand, borrowers face higher costs in borrowing long-term and would tend to favor shorter-term loans and be ready to roll them over when expired. Why fear the flattening yield curve? Economic theory suggests that a flat (or inverted) yield curve could lead to recessions. In fact, many investors have also made the conclusion that a recession may arrive some time in 2020 or in the first half of 2021. When the yield curve is very flat or inverted, lenders have fewer incentives to make long-term loans because the returns in doing so are low relative to the their cost of capital (which is indexed to short-term deposit rates). As a result, banks tend to tighten their lending standards. This in turn shuts out a lot of borrowers from the credit market and could be negative for economic activities. We will proxy the yield curve with the 2y/10y UST curve, which is essentially the spread between 2- and 10-year US Government bonds. This spread is a closely watched macro indicator as 2- and 10-year are highly liquid US Government bonds with benchmark status in the market. Now, the yield curve has been flattening since the US Federal Reserve began the rate hike cycle in December 2015. As the Fed controls short-dated inter-bank money market rates (otherwise known as the Fed Funds), Fed’s hikes have larger impact on short-term rates, such as the 2-year than longer-term rates such as 10-year. So every time the Fed hike interest rates, there is a tendency for the yield curve to flatten further. In fact, it is no longer far-fetched to see the yield curve inverted. By StashAway’s estimates, if the Fed raises its Fed Funds rate by 0.75%-1.0% over the next 12 months (over three to four rate hikes of 25bps increment), the 2y/10y UST curve could hit negative territory (from 39bps to around -11 bps) and would become inverted. Let’s now take a look at data. Over the last 18 years, we have witnessed two major bear markets for equities. The first bear market took place after the bursting of the US technology bubble (March-October 2000) where the Nasdaq Composite and the S&P 500 declined by 78.4% and 50.9%, respectively. The other bear market happened during the housing market crisis of 2008. During that time, the S&P 500 declined by around 57.7% between November 2007 and March 2009. We have highlighted these two bear markets as the shaded regions in Figure 3. A closer look would reveal that these bear markets did not happen when the yield curve inverts. Instead, these bear markets happened when the yield curve “re-steepened” after the inversion. This means that the true culprit behind a slowdown in the economy has something to do with the larger rise in long term bond yields over short-term. Staying flat or inverted is what matters! While it is important to take note of yield curve inversions, it is also worth noting that bear markets usually don’t immediately follow. Stocks can continue to climb substantially and for a long time well after the inversion. There were also false signals in the 1990s (as can be observed on the the left side of Figure 3), where the yield curve inversion failed to produce a big downturn. Taking these signals too literally can be costly to investors! 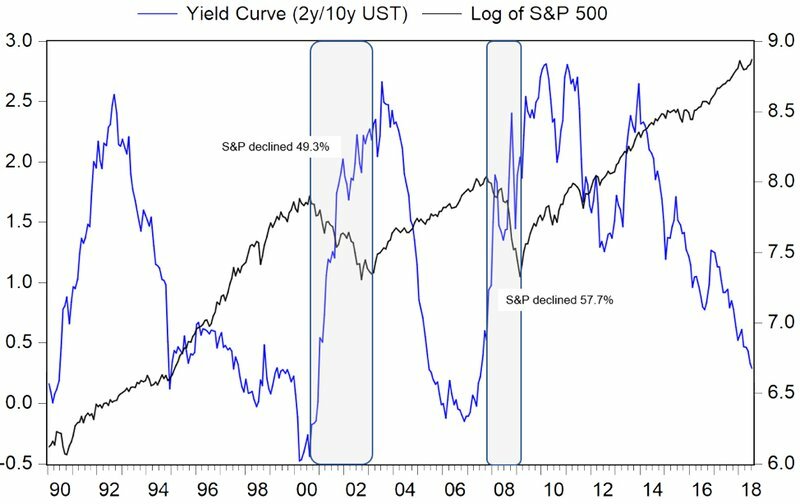 The lesson is not about blindly following or ignoring the yield curve, but to understand why it is not a recession-timing tool. Economic data continues to stay positive, and the markets have absorbed significant shocks since February 2018. StashAway’s ERAA model continues to confirm that growth-oriented assets will perform well, albeit the path may include volatile periods. Additionally, we reiterate the need for investors to have diversified portfolios and to allocate part of their investments to protective asset classes as this will increase risk-adjusted returns in the medium-term.